We all make mistakes - it happens to the best of us. The distance was manually added and not automatically pulled in through a wearable - e.g. Fitbit. 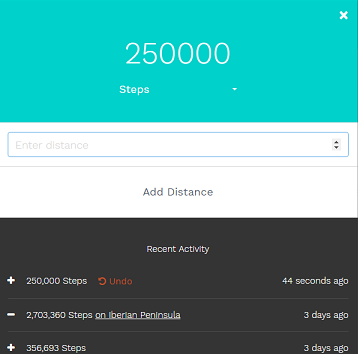 The distance was recently added (at most 1 month ago) and shows in the "Recent Activity" on the add steps (bank distance) modal. 2. 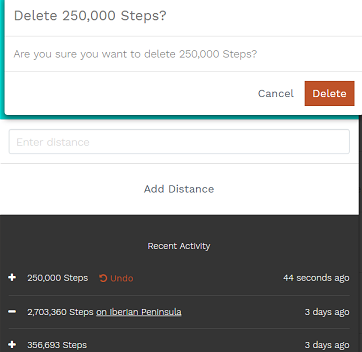 Click on "Undo" beside the accidental distance you want to delete - for example 250,000 steps in the example. 3. On the confirmation popup dialog, check the distance and confirm by clicking "Delete"
Still stuck? Get in touch and we'll try out best to help.